For more than 25 years, people have turned to For Dummies guides for help understanding everything from football, lawn care and auto repair to nuclear physics, parenting and personal investing. Thanks to an IBM limited edition of the distinctive black and yellow resource book, the same, friendly formula is now helping to transform the IT organization and establish a roadmap for change. True to the brand, IT as a Service for Dummies takes a hard-to-understand concept and translates it into an easy-to-use, four-chapter manual for digital transformation. Authors Judith Hurwitz and Daniel Kirsh introduce readers to a world of dramatic IT changes, where businesses are rapidly recognizing IT services as the foundation for the customer experience. With services ranging from simple computing and cloud storage to microservices that drive efficiencies, IT as a Service (ITaaS) enables companies to secure appropriate services based on price, availability, security, and level of service required. Most Dummies guides are written for far more knowledgeable readers than the titles imply and IT as a Service for Dummies is no exception. The intended audience for this book is the organizational leader who understands the potential value of a services model and appreciates the importance of agility, security and innovation. By transitioning to an ITaaS model, IT organizations gain the trust of business leaders, keep costs in check, and help businesses make better-informed decisions. So how to make this transition and benefit from the value of new IT? On the Road Again: The ITaaS journey begins with a critical assessment of the business’s strengths and weaknesses and the creation of a road map to move forward. Whether or not a business can transition quickly to an ITaaS model depends on the agility of its current IT infrastructure and the elements in place to support the transformation. It’s a Mod Mod World: Modular service is the foundation for a cloud marketplace. When moving from a hierarchical computing model to a flexible services model, create a catalogue of services that combine to create new applications. Clarify where each service originated and provide guidance for users. Leveraging an ITaaS model based on modular services results in greater flexibility and the ability to customize workloads based on performance, security, and cost. Automate to Innovate: ITaaS depends on four automation services. Orchestration services use automation to connect on-premise services with services in both the public and private cloud. Business policy services ensure that users access the right data. Catalogue services protect the integrity of the business by identifying and managing all elements comprising the as?a?Service model. Workload balancing services help linked services operating in a cohesive, consistent manner. Go for Brokering: Cloud brokers keep businesses flexible by providing managed services, data centre services, and self-service IT across all cloud models and from multiple suppliers. By combining planning services with software infrastructure, they equip businesses with a comprehensive picture of both cloud and on-premises resources. Hurwitz and Kirsh compare this to a supply chain where all the individual elements work together seamlessly. Chain, Chain, Chain: The success of ITaaS relies heavily on a transparent supply chain that links business elements and IT in a way that supports change and results in economies of scale. Coordinating a complex ecosystem of partners and management services protects the organization from risky practices such as Shadow IT and assures the efficacy of the application management and operations platform. Serve and Protect: There are three key factors in creating a secure ITaaS environment: security policies and controls designed as part of the ITaaS fabric; basic data governance protocols; and services that act as an integrated environment to support customers. Leveraging the Service Catalogue: A standardized, self-service desk allows users to access the cloud resources they need, change passwords, and create new applications using templates built on best practices. The patterns created by these best practices can be transformed into code and used again. You’re not alone: There’s safety in numbers. Rather than go it alone, talk to your peers. Engage with experts in the field. Check out this link to some IBM resources for understanding everything ITaaS has to offer: ibm.biz/itasaservice. 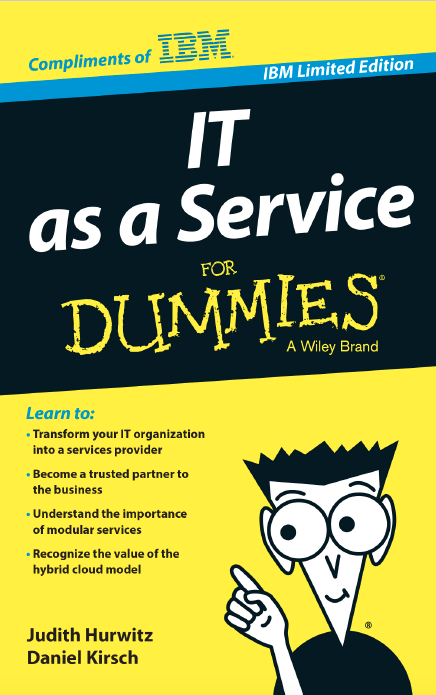 IT as a Service for Dummies is available for download. Get your copy today.